Buying a new speaker entails putting into consideration a number of specifications. These specifications will confirm to you the speaker’s capability of delivering good sound. Furthermore, the know-how of the speaker’s ability will help prevent costly mistakes while making this purchase. You will get value for your money by acquiring a quality speaker, accompanied with great features. In case you are planning on buying a new home theater or any other speaker ensure you test them to determine their capability. Avoid buying blindly without considering some key features. 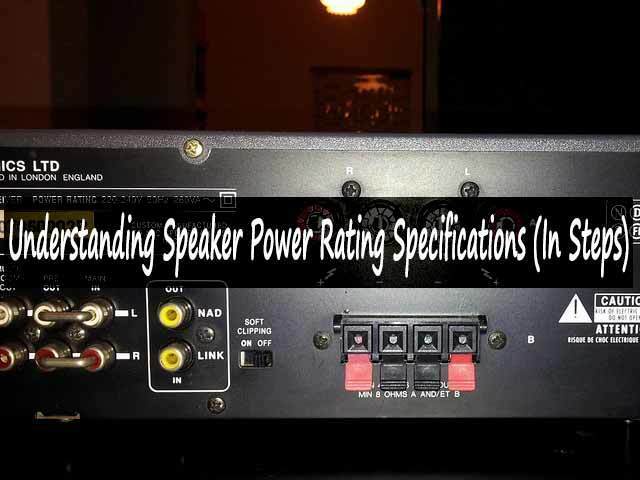 One of the specifications you need to put into account is Speaker power rating. It is referred to as the continuous or nominal power a speaker can handle before getting destroyed. In addition, it can also be considered as a short-time topmost input power a speaker can handle. This specification is usually listed alongside other features for customers to have a look at. After which they can make a sober purchase. It is something you should always be on the lookout for when buying a loudspeaker. Normally it is neatly put alongside other speaker’s specifications. So earnestly study it. Basically, it refers to the lowest power a speaker can hold before being distorted. This power valuation does play an important function in ensuring you maintain the right level of power. Furthermore, it helps prevent extra repair maintenance costs which might occur through damaging your speaker. You can ensure your amplifier provides this power rating at its very least. This is a very common consideration of speaker power rating. It is the maximum power a speaker can bear before getting distorted. Distortion of the speaker means the speaker will start producing weird sound or might entirely get damaged. The maximum input power is normally set at considerable levels. There is a possibility you can go past the maximum speaker power rating level. However, ensure it does not occur on a regular basis lest you spoil your speaker within a short period of time. Just ensure the speaker power is maintained at a significantly reasonable level. At that level, you can still enjoy your music in fact, without incurring speaker maintenance and repair costs. Make it your initiative to put this consideration in mind. Nevertheless, as long as you are good with volume control you can pair any speaker using any amplifier despite the power rating. But be more vigilant while doing so since it greatly exposes your speaker to quick damage. Your speaker power rating comprises a lot more features. RMS or if you like average power is a great contributor to the power rating of any speaker. Knowing the RMS plays an important role in choosing the right amplifier for your speakers. It ensures both the speaker and amplifier works for hand in hand giving you the much-desired sound in your house. Peak values can also be referred to as maximum power value a speaker can hold. Knowing the exact value ensures you maintain a substantial amount of volume so that your speaker can last for long. Furthermore, this knowledge will allow you to pair your speaker with the right amplifier. It is something you cannot afford to ignore while out shopping for a speaker. This is a place where a lot of people have really failed terribly. Most people just go about purchasing amplifiers without putting into consideration the speaker’s power rating. Quite often they purchase a completely incompatible amplifier to the speaker. The amplifier ends up distorting the speaker once the two are put together. There is a suggested amplifier power range one needs to consider. Speaker manufacturers have really tried to offer much help in this area. Usually, they give a suggested amplifier power range that can be used with speakers. To some great extent, it minimizes the destruction imposed on the speaker. The amplifier range is always between 50-200 watts for every channel. With this range, you can now purchase an amplifier which is compatible with your speakers. As a music enthusiast, choosing a speaker should be something you highly regard. Ensure you carefully get to know the specifications of the speaker you intend to buy. Speaker power rating is one important feature you need broad knowledge about. Ensure you are well versed with the specifications of your speaker power rating before purchasing. Remember, for an efficient sound system, you will need a speaker with an unmatched power rating specifications.